Across from the shady oaks of an historic Savannah square – the Commons House of Assembly met here in 1770 – you’ll find the lantern-lit entrance to the Planters Inn. The Inn stands on the original site of the parsonage of John Wesley - the founder of Methodism. Inside, pretty, period-inspired furnishing – think four-posters and fresh flowers – is met with the kind of attention to guests only possible in an intimate, 60-room inn. The comfort is in the details. Everything – from chintz curtains to the wrought-iron balconies overlooking Reynolds Square to the breakfast delivered to your room in the mornings (so you can stay in that four-poster bed a bit longer) – adds up to a romantic and restful experience. Swap stories about your day in Savannah with fellow travelers at the complimentary, late-afternoon Wine and Cheese Socials. A Savannah favorite, The Olde Pink House serves up such specialties as Lump Crab Hush Puppies with Spicy Peach Remoulade and Bourbon Molasses Grilled Pork Tenderloin. 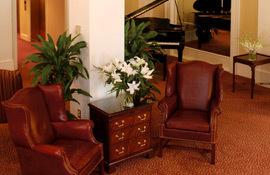 On Reynolds Square and surrounded by Savannah’s Historic Landmark District, The Planters Inn is near Wright Square, the Forsyth Park Fountain, the Savannah College of Art and Design, and the city’s famous River Street. Reservations must be cancelled 48 hours prior to arrival date.